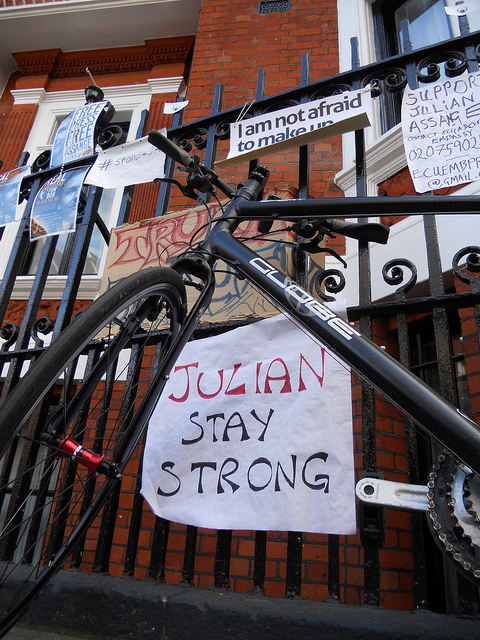 Since Wednesday 20 June, a vigil has been held daily outside the Ecuadorian Embassy. 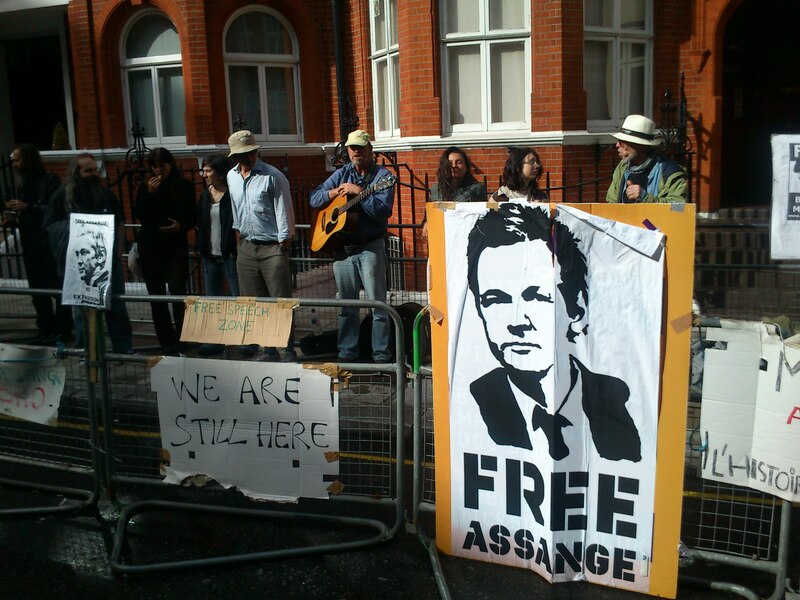 The people gathered there stand in solidarity with Assange, a persecuted war resister. 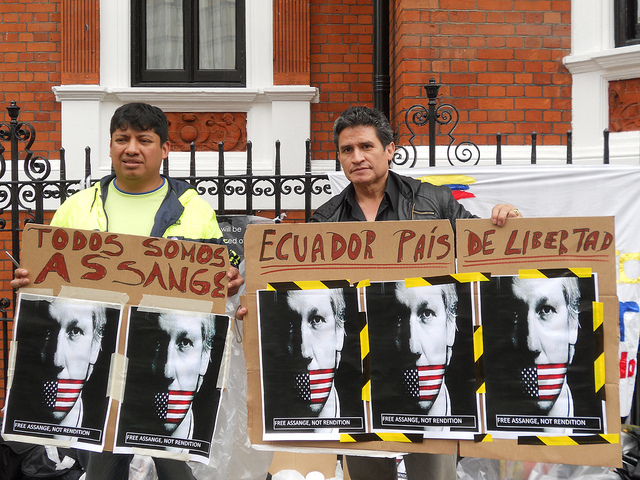 They also stand in support of the Ecuadorian people in whose hands the fate of Assange lies. If you are in London, why not drop by the vigil and stand for Assange. The numbers usually build up in the afternoon and peak around 1700hrs. [I]t is clear that there is a legal process in place which will result in taking Julian to the US, which if allowed to succeed would violate his basic rights. It is accepted by the UK Supreme Court that Julian Assange has not been charged with any criminal offence in Sweden. It is also accepted that he was by told by Swedish authorities that he was free to leave Sweden. And it is also accepted that he has continuously offered to be interviewed by the Swedish authorities here in the UK, should they wish to do so. Although it is normal procedure, Swedish authorities have refused, without reason, to make the 3 hour trip to London and to interview Julian causing him to be trapped in the UK under virtual house arrest for 561 days and an additional 10 days in solitary confinement – all without charge. Instead they have issued an INTERPOL Red notice and extradition requests. Julian and his legal team have previously sought assurances from both the UK government and the Swedish government that they will guarantee safe passage after the completion of legal interviews with Mr Assange and both have previously refused, although we are hopeful they will look at the matter again. The Swedish executive publicly announced on June 14 that it would detain Mr. Assange in prison without charge. Once in Sweden under such grave restrictions it would be impossible for Mr. Assange to exercise his asylum rights. Mr. Assange did not feel safe from US extradition in the UK. We are all too aware of the abuses of the US-UK extradition treaty. Although Mr. Assange has been trapped in the UK, under dangerous circumstances, he at least has had the freedom to apply for political asylum. It is in this context that Julian has made the difficult decision to seek refuge inside the Ecuadorian Embassy to ask for asylum. Gallery | This entry was posted in Assange, Manning, Reports and tagged anti-war, Bradley Manning, Britain, court, extradition, Julian Assange, London, solidarity, torture, US, vigil, WikiLeaks. Bookmark the permalink. I take it Wikileaks and Assange had/have the foresight to install a dead-man switch server that contains highly embarrassing information to be released automatically to – say – 150 media oulets if Assange doesn’t access the Internet for more than – say – 5 days or so ??? You are in the publishing the above statement of facts by the Assange Defence Fund about the harassment of Mr Assange to be complimented, for your campaigning efforts. Indeed, during the last few years I have cited these facts on many occasions to the GUARDIAN newspaper’s ‘ comment is free’ website, and the unknown publisher’s moderator: has very promptly remove my posting! – would that be a good change of theme some days outside the Equadorian Embassy? This Greater London Authority and Metropolitan Police seem to spend a lot of paid hours on loitering outside an embassy. If they happened to stop for fag breaks at well-advertised times, or promoted the art of tunelling through attics, or stopped the guard on bank holidays, then surely Mr Assange would pop-up somewhere else and the money could then be better spent, After all, this tax bill is tolerated because cheap public services are provided, not because taxpayers want to help a sweedish junior judge in a silly extradition or her backers.